More D and K2 for Less! 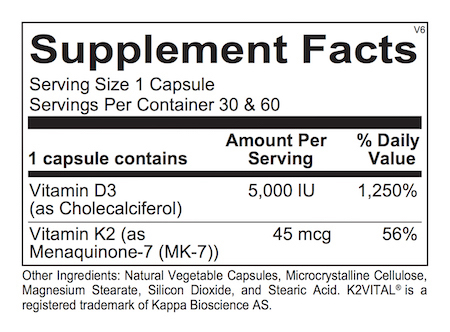 Vitamin K is a family of similarly structured molecules. There are three different vitamin K molecules. Vitamin K2, menaquinones, are produced naturally by bacteria unlike its more popular cousin, vitamin K1, which is found in greater concentrations in green leafy vegetables. 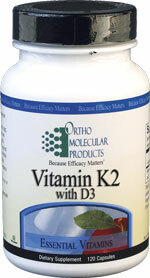 The combination of vitamin K2 with vitamin D3 has been suggested in recent studies to promote bone health. What is Vitamin K with D3? A growing body of research shows that when it comes to bone health, ensuring optimal intake of vitamin K is a critical piece of the puzzle. New research is focusing on the synergistic relationship between vitamin K (specifically, vitamin K2) and vitamin D3, especially in terms of bone strength and cardiovascular health. A group of naturally occurring and structurally similar, fat-soluble vitamins, vitamin K is essential for the proper utilization of calcium. Through its activation of the protein osteocalcin, vitamin K helps to bind newly absorbed calcium to the mineral matrix in bone. In addition, vitamin K has been found to help maintain bone mineral density by decreasing the activity of osteoclasts, a cell that breaks down the bone matrix. Vitamin K also provides critical cardiovascular protection by helping to carboxylate Matrix GLA Protein (MGP), an inhibitor of circulatory calcification., Thus, vitamin K and vitamin D not only share similar qualities, but they also act synergistically with one another within the body. 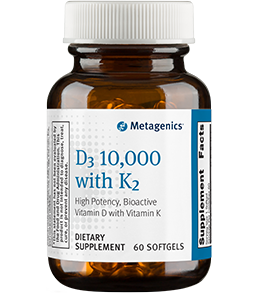 This formulation of Vitamin K2 with D3 includes 45 mcg of vitamin K2 delivered as MK-7 and 5,000 IU of vitamin D3 per capsule, for optimal absorption and use by the body. New evidence also suggests vitamin K plays a central role in balancing immune health. Recent studies have shown that both vitamins D and K impart immune-modulating effects. In the Framingham Offspring Study, one of the longest standing studies on generational health, higher serum levels of vitamins D and K were associated with stronger immune function and a balanced inflammatory response. [16, 17] In a 2011 study, vitamin K was also found to suppress various markers of the immune system. Wheat, gluten, dairy products, fish, shellfish, peanuts, tree nuts, egg, artificial colors, artificial sweeteners or preservatives. 1. Schurgers LJ, Spronk HM, Soute BA, Schiffers PM, DeMey JG, Vermeer C. Blood. Regression of warfarininduced medial elastocalcinosis by high intake of vitamin K in rats 2007;109(7):2823-31. 2. Weber P. Management of osteoporosis: is there a role for vitamin K? Int J Vitam Nutr Res 1997;67(5):350-6. 3. Geleijnse JM, et al. Dietary intake of menaquinone is associated with a reduced risk of coronary heart disease: the Rotterdam Study. J Nutr 2004;134(11):3100-5. 4. Beulens JW, High dietary menaquinone intake is associated with reduced coronary calcification. Atherosclerosis 2009;203(2):489-93. Epub 2008 Jul 19. 5. Kidd PM. Vitamins D and K as pleiotropic nutrients: clinical importance to the skeletal and cardiovascular systems and preliminary evidence for synergy. Altern Med Rev 2010;15(3):199-222. 6. Plaza SM, Lamson DW. Vitamin K2 in bone metabolism and osteoporosis. Altern Med Rev 2005;10(1):24-35. 7. Schurgers LJ, Teunissen KJ, Hamulyák K, Knapen MH, Vik H, Vermeer C. Vitamin K-containing dietary supplements: comparison of synthetic vitamin K1 and natto-derived menaquinone. Blood 2007;109(8): 3279-83. Epub 2006 Dec 7. -7. 8. Shearer MJ. Vitamin K metabolism and nutriture. Blood Rev 1992;6(2):92-104. 11. Kaneki M, Hodges SJ, Hosoi T, Fujiwara S, Lyons A, Crean SJ, Ishida N, Nakagawa M, Takechi M, Sano Y, Mizuno Y, Hoshino S, Miyao M, Inoue S, Horiki K, Shiraki M, Ouchi Y, Orimo H. Japanese fermented soybean food as the major determinant of the large geographic difference in circulating levels of vitamin K2: possible implications for hip-fracture risk. Nutrition 2001; 17(4):315-21. 12. Ushiroyama T, Ikeda A, Ueki M. Effect of continuous combined therapy with vitamin K(2) and vitamin D(3) on bone mineral density and coagulofibrinolysis function in postmenopausal women. Maturitas 2002; 41(3):211-21. 13. Geleijnse JM, Vermeer C, Grobbee DE, Schurgers LJ, Knapen MH, van der Meer IM, Hofman A, Witteman JC. Dietary intake of menaquinone is associated with a reduced risk of coronary heart disease: the Rotterdam Study. J Nutr 2004; 134(11):3100-5. 14. Beulens JW, van der A DL, Grobbee DE, Sluijs I, Spijkerman AM, van der Schouw YT. Dietary phylloquinone and menaquinones intakes and risk of type 2 diabetes. Diabetes Care 2010; 33(8):1699-705. 15. Choi HJ, Yu J, Choi H, An JH, Kim SW, Park KS, Jang HC, Kim SY, Shin CS. Vitamin K2 supplementation improves insulin sensitivity via osteocalcin metabolism: a placebo-controlled trial. Diabetes Care 2011; 34(9):e147. 16. Shea MK, Booth SL, Massaro JM, Jacques PF, D’Agostino RB Sr, Dawson-Hughes B, Ordovas JM, O’Donnell CJ, Kathiresan S, Keaney JF Jr, Vasan RS, Benjamin EJ. Vitamin K and vitamin D status: associations with inflammatory markers in the Framingham Offspring Study. Am J Epidemiol 2008; 167(3):313-20. 17. Iijima H, Shinzaki S, Takehara T. The importance of vitamins D and K for the bone health and immune function in inflammatory bowel disease. Curr Opin Clin Nutr Metab Care 2012; 15(6):635-40. 18. Checker R, Sharma D, Sandur SK, Khan NM, Patwardhan RS, Kohli V, Sainis KB. Vitamin K3 suppressed inflammatory and immune responses in a redox-dependent manner. Free Radic Res 2011; 45(8):975-85. Epub 2011 Jun 9.